A very engrossing ghostly tale set in Russia. A woman from the States returns to her parental home where tragedy left her an orphan. With a daughter of her own, she travels back solo after many decades to not only claim the inherited deteriorated house, but also to face her past and come to grips with the horror left behind. What she finds is a dark, evil place that won’t let her go. Not knowing anything about her past, the bloody and deadly truth soon seeps from the dilapidated walls of the farmhouse where another apparent sibling also arrives. Together they become trapped by the dark forces hovering over the house. 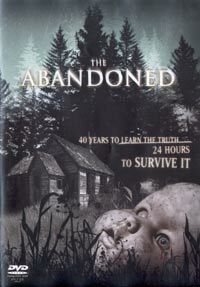 With a foreboding atmosphere and some scary moments, The Abandoned is more of a psychological experience than a splatterfest – although there are moments of blood and intensity. A very moody and timely film, co-written by South African born Richard Stanley who made Hardware and Dust Devil.